The following guide will provide an overview of the new GST (Goods and Service Tax) changes that are available in Sage One as well as how to handle the changeover from SST (Sales and Service Tax) to GST. From 1 April 2015 GST will replace the existing SST. If you have registered for GST you will need to start capturing both sales and purchases tax on your transactions. All of the system requirements required for GST are available to you and will be explained to you below. What if you are not GST Registered? If you have not registered for GST then you will select the No Tax option under your Company Settings. This means that you don’t need to worry about recording any tax on your transactions. All of the new GST Tax Codes will be available for processing in Sage One. There are different tax types for sales and for purchases, these are marked by either an “S” or a “P” at the beginning of the tax type Description. The system will set the default tax type to “S [SR] Standard- Rated supplies”. You can also update the default tax types on sales and purchases of your items in the Item Masterfile this will be explained in Part 2 of this document. These will be available for you to set up under Company Settings. A list of the major industry codes can be found on the Malaysian Government statistics website (www.statistics.gov.my). You will also be able to assign these major industry codes to each individual item on the item masterfiles. The major industry codes will form part of GST Calculation Report under Item 19. This will assist users in the completion of the GST-03. You are required to capture a reason code on your credit notes and supplier returns. 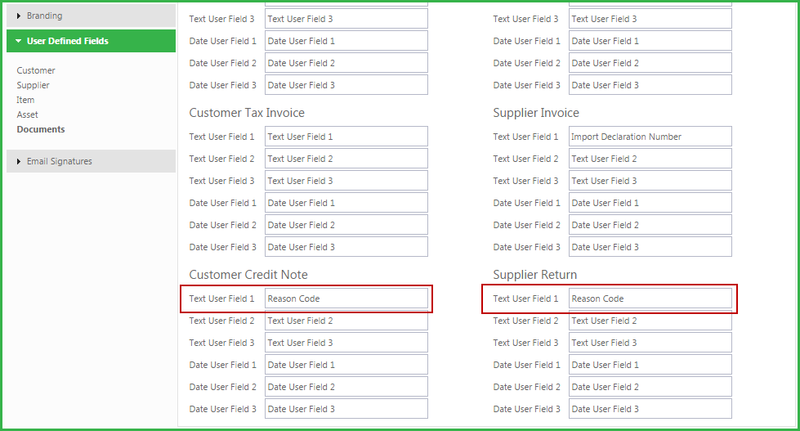 The first user defined field for both Customer Credit Notes and Supplier Returns has been set as the Reason Code. 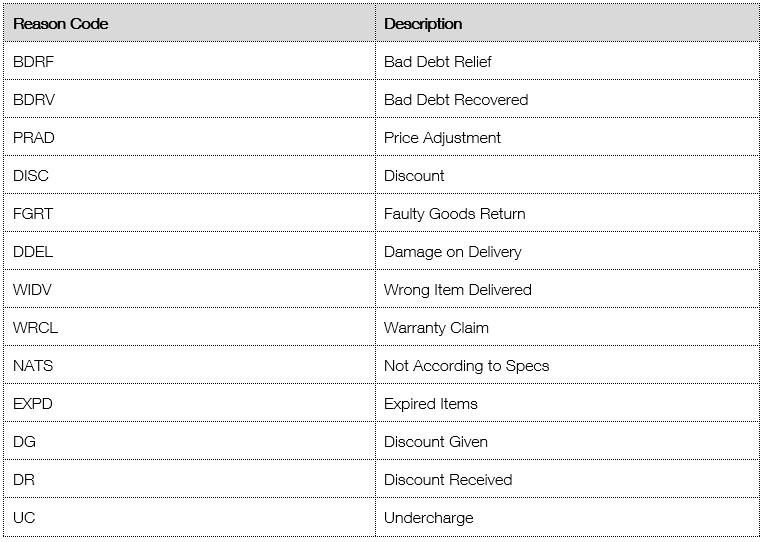 This will be available under document options on customer credit notes and supplier returns. The reason code will appear under Document User Defined fields which are available under the Document Options drop down on customer credit notes and supplier returns. This reason code will appear on the printout of the credit note or return. You will need to manually insert the reason code on the credit note or supplier return under document user defined fields. Below is a list of sample reason codes for your reference. The following default document layouts will be available to you under your company settings. Remember, you can add a custom layout to your profile at any time by downloading the Sage One Custom Layout Designer. Default document layouts can be set up on both customer and supplier masterfiles and can also be set at the time of processing a document. This will be your default layout available for most of your documents, including Customer Invoices and Supplier Invoices. It has been updated to include the GST requirements which include the tax code to appear on the invoice lines, a tax breakdown illustrating the value of the separate tax types on the invoice as well as the amount to display in words. 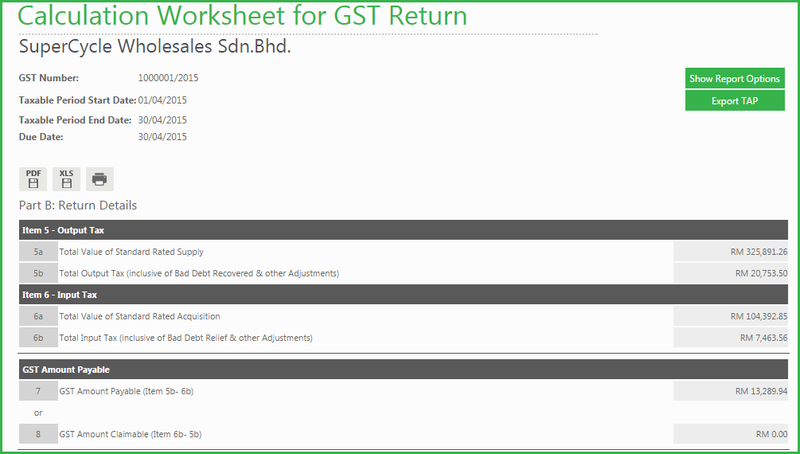 This layout has been updated to include the GST requirements mentioned above. These layouts have been included as the default layouts for customer credit notes and supplier returns, these new layouts will be very similar to the modern layout with the addition of the reason code entered on the document as well as the linked invoice number and linked invoice date from the original document that the credit note or return was linked to. If any of your suppliers require a self-billed invoice you can set this document type as the default on their masterfile. This will print out the normal supplier invoice in the self-billed invoice format. 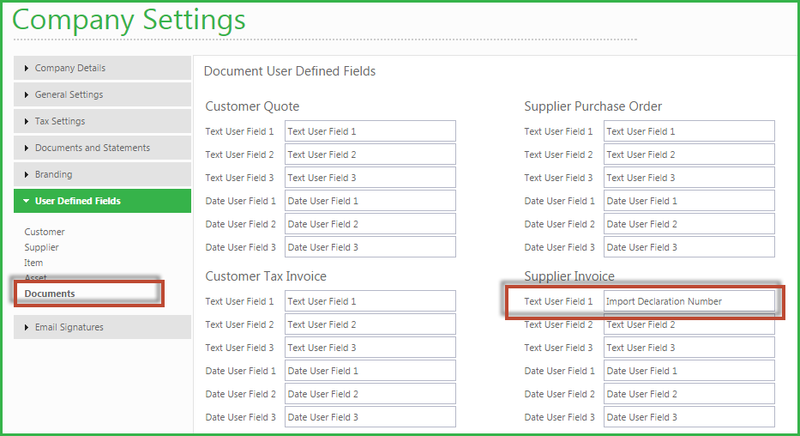 The first user defined field for supplier invoices has been set as the Import Declaration Number. This will be available under document options on supplier invoices once you have saved your company settings. The import declaration number will appear under Document User Defined fields which are available under the Document Options drop down on a supplier invoice. The import declaration number will be available for selection in the Sage One Custom Layout Designer if you would like to include it on any of your custom layouts. These transactions which relate to long outstanding amounts allow you to claim back tax paid on overdue invoices. The same applies to supplier transactions (Output Tax Adjustments and Input Tax Adjustments).Only invoices that were raised on or / after the GST date (1 April 2015) and have been outstanding for more than 6 months will be available for bad debt relief or an output tax adjustment. This will be available as one of the GST tax types. Transactions processed to this tax type will not form part of the Tax Payable amount but will rather form part of the GST Expense Account. Users will be able to export a TAP file from the GST Calculation Report. This can be used to assist with the completion of the GST-03 submission. You are able to export a GAF file from the Tax Returns and Reports screen (this will be used for tax audit purposes).The GAF export is available in both XML and Bar-Delimited format. You will have access to comprehensive tax reporting in Sage One Accounting. You will need to close off your SST Tax period as your first tax period and then set up your GST Tax periods. This will be explained to you in Part 2. There will be an specific a GST report called the GST Calculation Report which will be available for GST reporting. This report will assist users in completing their GST-03 submission. We recommend the following steps to set your company up for GST. 1. If you are GST registered make sure your Tax System is set to Invoice Based. 2. Include your GST/Tax number under the Tax Details Section. 3. Ignore the Tax Period dates and Tax Period frequency – you will set this up later. 4. The system has set your default Tax Type to “S [SR] Standard-rated supplies”, this should be the Tax Type you expect to use the most, you can change your default Tax Type to another GST tax type if you wish by clicking on the default checkbox. 1. These can be set up under Company Details…Additional Company Information. 2. Add all the codes that are relevant to your company. 3. The default Major Industry Code will be used for any new items you create. 1. Under Additional Company Information. 2. Include your Company’s City, State and Country. 1. To get to your item masterfile go to Items Menu > Lists > List of Items > click on edit. a. Assign the correct major industry code as set up in Company Settings. 1. To get to your customer masterfile go to Customers Menu…Lists…List of Customers…click on edit. 2. To get to your supplier masterfile go to Suppliers Menu…Lists…List of Suppliers…click on edit. a. Enter their Business Registration Number. b. Enter their GST Status Verified. c. [Suppliers only] Remember to enter the RMCD Approval Number for Self-Billed Invoice. 4. Include your customer’s country on your customer masterfile under User Defined Fields. a. Accountant’s Area menu…Tax…Tax Returns and Reporting. 2. You will enter a wizard to setup your Tax Periods for the first time. 3. Confirm your Tax/GST number. a. Set this date to 31/03/2015 as it represents the end of SST Reporting and the beginning of GST Reporting. 5. Set your Last Tax Submission Due Date. a. Set this date to 30/04/2015 – this will assist you with your submission due dates for your new GST Tax Periods these must be the last day of the following month after your Tax Period. We have automatically created any new accounts for GST purposes in your Company. If you need to add any other new accounts these can be created from the Accounts Menu. 1. Go the Accountant’s Area Menu…Trial Balance Export…Assign Account Numbers. 2. Type in the account numbers alongside the relevant account. When an advance payment is received from a customer before the actual sale takes place (no invoice raised), it is subject to 6% GST inclusive. Record the Advance payment normally as a Customer Receipt in your cashbook. Customers Menu…Transactions…Customer Adjustments…Quick Entry Grid. You need to process 2 adjustments (1 increase an 1 decrease). The inclusive amount for both lines should be the value of the advance payment received. f.	The by Affecting account should be the new account GST Suspense. If you have not submitted your GST you can simply delete the original adjustments. Sage One does not raise tax on supplier payments you will therefore need to raise the tax effect manually in the system. You will need to capture the purchases tax “P [TX] Taxable Supplies” using a Supplier Adjustment and you will need to capture the supply tax ‘S [DS] Deemed Supplies” using a Customer Adjustment. Record the Supplier payment normally as a Supplier Payment in your cashbook. The Supplier will be the dummy supplier set up “GST Clearing Supplier “. The amount (exclusive) for both lines should be the value of the supplier payment. The by Affecting account should be the new account GST Suspense. The Customer will be the dummy customer set up “GST Clearing Customer “.